Ho Ronnie, please read the 3rd post above your post. The answer is still the same. The only benefit of Renocia is there are no side effects like Minnoxidil. Barring that there is no great benefits you will get from Renocia. The only treatment for hair loss currently is hair transplant, all the medications are temporary and aggravate the hair loss the moment you stop using them, if you continue to use them for long periods, such as greater than 1 year, there are damaging side effects to your health. These medications are not worth the effects on ones health over long time. May be once there are better treatments that we could opt in, but until then hair transplant is the only option. I would advise to stay away from any lotion, they only provide temporary growth. I know this was a very long post but looking at the way you replied I saw myself in the same panic situation a couple of years ago, thought you should face the facts. Hi Farz, I know how you are feeling and I was in the same state a couple of years ago. But you have to face the fact that there is no cure in the regular hairfall treatments being offered currently. I do not know about homeopathy or ayurveda so I cannot answer that. I have researched almost everywhere online, doctor consultation in India and US, there is no cure or stopping the hairfall. All the methods are temporary, like using minnoxidil will give you results only till you use it, once you stop using it, the hair fall be even more faster and dreadfull ( I have personally faced it ), add to it there are side effects as well. In current day scenario hair transplant is the only permanent option available, which will get your hair back. However I'm not a big fan of har transplant, that is why I have been searching for cure/medication which can get the hair to regrow and keep them intact. The only promising research towards this cure is the stem cell therapy, which is under research for few years now. The last I knew was using stem cell therapy, hair was successfully regrown on rats and the next was human testing. I did not hear any news after this. I'm patiently waiting to hear the results of this treatment. Please note that there are many clinics which offer stem cell therapy, this is not the actual stem cell therapy and none of them are genuine, do not fall prey to any such clinics. I'm 27 years, started loosing my hair when I was 23 and with in one year I lost all my hair. By age 25 I was norwood 5. I have come to terms with my hair loss and calmed down now. Since the last one year I have been sporting a clean shave look, which is much better than being half bald. Hi Blake, Sorry, I didn't mean to violate any rules of this community. For future purposes can you tell me how to give reference to such links? You certainly know I wasn't advertising or spamming. Also note if anyone who is nearby to Wisconsin, please see if you can schedule an appointment and see what this is. They provide free consultation. Does anyone know about Transitions of Wisconsin, Below is the link to their website **outside link removed by moderator** They claim to provide non surgical treatments, one of them is the laser therapy, below is the link to the specific treatment that I'm referring to, the page also has a youtube video which explains what the treatment is about. **outside link removed by moderator** Is there anyone who have already tried this treatment or if anyone know how legitimate is this treatment, is it good, bad. Ugly?? Does it really provide the results it claims to be? Hi Faraz, I really appreciate your efforts for updating the comments periodically since you started using Renocia. Before writing Renocia off completely could you please explain for how long have you used Renocia and what was your dosage (daily/twice or thrice or four times a week). What else have you used during the same period, any other medicines? 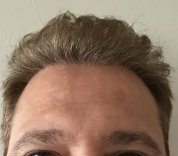 Even though I have been using renocia once a day for more than six months, I cannot give an answer to how effective it is, since I started sporting a clean shave look as I lost more than 50% of my hair on the temple region. And I know that no matter what medicine I use there will never be any hair restoration, except hair transplant. However I haven't tried homeopathy or ayurveda treatment. Ritik, yes it is very costly compared to Minnoxidil. Also you should be using the shampoo and the regular solution daily. My doctor suggested me to use a mix of minnoxidil and renocia solution, 3 days a week renocia and 4 days a week Minnoxidil. However I don't use it that way, since I have side effects using minnoxidil, I get very severe headaches(migrane). I have used minnoxidil before for two years to three years from 2008 to 2010 and the results were far more quick than Renocia. I had thicker hair and faster growth but the ugly stickiness and the white residue was an irritation. Remember that it did not stop my hair loss and as per my extensive research currently hair transplant is the only way. The results from Renocia are very slow but similar output as minnoxidil, never better than the later. I have been eagerly waiting for the Stem Cell restoration research to come to rescuse, that has remained a wait tii date. Don't fall prey to the stem Cell therapy for hair loss given by many hair clinics, that is not the actual stem cell therapy. As per my doctor, there are no known side effects of Renocia and that it is a complete tropical solution. Also the doctor said the effectiveness of Renocia is same as Minnoxidil or even better without the side effects. My personal experience is better with Renocia than minnoxidil, with minnoxidil you have those ugly sticky hairs after application and it tends form white crystals after drying, such problems are not there with Renocia, it gets dry within 5 to 10 seconds of application and you will not even know that some solution was applied after those 10 seconds from application. Now about the effectiveness of Renocia is something I do not know yet, it will be 2 months in another week, that I have used Renocia, this time frame is not enough to say if Renocia is as effective as minnoxidil. Added to this not many know about this product and hence I posted in this forum if anyone has more knowledge on the product's affects or effects. Yes, I could not find anything online too, that's the reason I was checking if anyone in this community have any knowledge of this product, since moderators here are more experienced and knowledgeble.